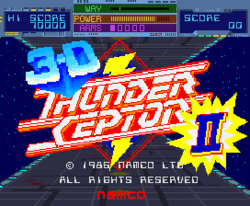 3-D Thunder Ceptor II (or just Thunder Ceptor II) is a three-dimensional shooter arcade game that was released by Namco, in 1986. As the name suggests, it is their sequel to Thunder Ceptor, (which was released earlier in 1986), and it also runs on their same dedicated hardware (a Motorola M6809 running at 1.536 MHz, two Motorola M65C02s running at 2.048 MHz and Motorola 68000 running at 12.288 MHz), meaning it tied with its predecessor for Namco's title of their most powerful 8-bit game. For a second time, the player takes up control of the Thunder Ceptor (which has undergone a colour change); there are also two more commands in this sequel than there were in the original game, and two different types of powerups have been introduced. The colour of the enemies has been changed from gray to green and most of the old ones have been renamed - several new ones have also been introduced as well, and the obstacles (there are also three new types of them as well here), can now be killed by firing a bomb at them (which means you will no longer have to fly into them all to remove them from the game at the expense of having the Thunder Ceptor's power decrease by one once it's resurrected). This was also the only 3-D game that Namco released, during their time in the arcades. This page was last edited on 12 December 2012, at 17:27.